We’d love your help. Let us know what’s wrong with this preview of Waiting for Aphrodite by Sue Hubbell. To ask other readers questions about Waiting for Aphrodite, please sign up. Hubbell takes us further into her explorations of the spineless world which she started in Broadsides from the Other Orders: A Book of Bugs. Part science, part nature writing, part autobiographical, it's a pleasant stroll through some sea life, fire flies, worms, spiders, & other species. While there is a fair amount of science, she never gets bogged down technically, but makes sense of it to the common man of which she is one, just a very well educated one. Self-educated at that. Part of the Hubbell takes us further into her explorations of the spineless world which she started in Broadsides from the Other Orders: A Book of Bugs. Part science, part nature writing, part autobiographical, it's a pleasant stroll through some sea life, fire flies, worms, spiders, & other species. While there is a fair amount of science, she never gets bogged down technically, but makes sense of it to the common man of which she is one, just a very well educated one. Self-educated at that. Part of the charm is she just seems like a really neat lady, one that I'd love to spend time strolling the sea shore & woods with. She's obviously not afraid of hard work since she bought a new, if smaller chainsaw, in her mid 60s after finding out she just couldn't live without one. She also seems to have been able to access many scientists that most wouldn't even know about & she's traveled extensively. And always, she's learning. What could be better? The book was exceptionally well narrated. My only gripe is that the chapters are just numbered instead of titled, so there is no table of contents that I could hang notes on. That's a shame. I think I'll buy a paper version of this. As good as the audio book was, it is a book to browse occasionally since there are odd gems stuck about. Some are the proper names & habits of interesting little animals, others observations, & there are even some bits of poetry. We hadn't got life—or ecology—yet. And oceans of nutrient Oparin broth. And nary an acid was found any more. Appeared a new creature—we cannot say how. Fixed gaseous nitrogen into the cell. There emerged a respiring young heterotroph. Produced such fine creatures as coli and you. From Oparin broth to the final solution. We've come a long way since the world was all wet. This speaks well to her theme of conservation. We don't know what is really important in our ecosystem. She gives some great examples, including one about the die off of a specific species of sea urchin. Who cares? Well, the coral did because it couldn't get hold without the urchin to keep the area clear, so no new little ones were building habitat for the thousands (millions?) of other creatures that live there. Who knew? We certainly didn't. Yes, we know a lot, but our ignorance is far, far greater. Unlike so many other conservationists, she has a great view of invasives, too. She's certainly caused me to rethink my knee-jerk hatred of them. I found this book about invertebrates to be so charming. Obviously I loved the parts about my preferred invertebrates (the marine ones) but also it really heightened my ambivalence around the insect world. For example, I was completely delighted by the chapter on millipedes even though I get very squeamish about the actual physical fact of a millipede if one approaches me. from wanting to kill every bug they encounter! This was a fun little wander through the world of invertebrates. Hubbell's prose is wonderful (in the "full of wonder" sense of word) and easy to ready while packing in all kinds of scientific knowledge. There's excursions into natural history and the development of our understanding of evolution and taxonomy. There's snippets of geology and of Hubbell's own life. Hubbell guides us through all kinds of invertebrate creatures' biology and mysterious lives as she researches, travels, and discovers This was a fun little wander through the world of invertebrates. Hubbell's prose is wonderful (in the "full of wonder" sense of word) and easy to ready while packing in all kinds of scientific knowledge. There's excursions into natural history and the development of our understanding of evolution and taxonomy. There's snippets of geology and of Hubbell's own life. Hubbell guides us through all kinds of invertebrate creatures' biology and mysterious lives as she researches, travels, and discovers them herself. This is a biology class with your favorite, well-traveled English teacher. One of my favorite chapters (okay, this is actually really hard to choose, but here goes) was the one on bees. At least, this is one that I think has the clearest direct impact on everyday life. Did you know that honeybees are not native to the Americas? There are all kinds of American bees, most of whom pollinate very specific plants in certain regions or seasons and produce no wax or honey for us. Turns out part of the reason we're having such a hard time keeping our bees and pollinating our fields is because honeybees have become the only ones we use, and when kept in unnaturally large populations they become very susceptible to mites, parasites, and diseases. Native bees are often solitary workers, do poorly in colonies, are difficult to transport, etc. Native bees are adapted to a variety of plants in a small area, and we have covered our lands in miles of the same crop, and destroyed habitats (fields, fallen logs, etc.) where they nest. We now also grow probably as many "exotic" plants (for food and otherwise) as we do native ones. Our method of agriculture is increasingly untenable. We may need to not only scale back our fields, but look to pollinators native to the places from which our crops have come. It is worthwhile to point out here that this book came out in 1999. I do not know how many advances or changes in our methods since the research presented in this book, but certainly it has not been enough. Humans can glow under special circumstances. The blood of smokers is weakly chemoluminescent, and I read a report in a nineteenth-century text that dying people sometimes shine. Modern researchers have found that several mortal conditions make human blood give off even more light than that of smokers, so that may be what is behind those old reports. But in general we can't produce living light [bioluminescence]. An enormous number of other organisms - plants, animals, bacteria - can, however. Perhaps that is why we are so fascinated by the light. In this book of connected essays about invertebrates, the author moves back and forth between her new home on the Maine coast, her old home in Missouri, and other locations, including Belize. There are essays on horseshoe crabs, fireflies, millipedes, sea urchins, corals, sponges, earthworms, bees, pill bugs, and sea mice among others. One theme repeats -- there is so much that is not known about these animals' biology and habits. I read this some years ago, but ran across another of her books recently, and decided to read it again. Sue Hubbell writes Biology for the lay person, and in this book, she winds her discussion of a wide range of invertebrates around ideas of time--time past, future time, the scale of time, and so on. Her writing is elegant and accessible; part memoir and part science. I recommend all her books. I really enjoyed this book by a writer who has frequently contributed to The New Yorker. Sue Hubbell's tales of meeting with scientists who specialize in specific invertebrates are all spell-binding to someone like me, who loves sea creatures. 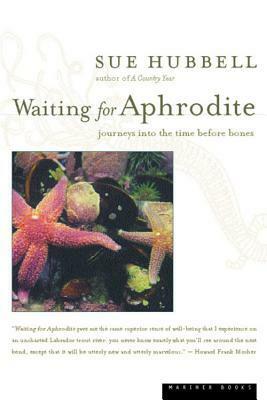 Waiting for Aphrodite is fascinating peek into the lives of a few charming invertebrates, along with a frank personal perspective on aging. 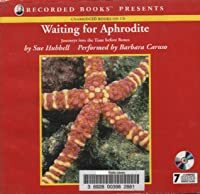 A splendid read because Hubbell integrates her own story with her fascination with invertebrates: sea urchins, earthworms, pill bugs, spiders, millipedes, bees, horseshoe crabs, and the sea mouse (Aprophodite)which is a worm that inhabits deep parts of the ocean. "We humans are a minority of giants, stumbling around in the world of little things." Splendid book! Sue Hubbell allows us to walk beside her, share her adventures and find meaning among the natural history and people around her. She pursues millipedes, sponges, and sea mice. Even if you think slimy sea creatures are disgusting, you will understand Hubbell's affection for such animals because of the skill with which she describes her quest for them and her experience of each. Good descriptions of one invertebrate after another, but that was one invertebrate too many. I'd have liked to have had more description of her life in Maine. Nothing bad here, actually rather interesting, but too much for one time. Hubbell's prose is as if she is carefully turning over stones and describing to you what she finds. More science than personal... if you like learning about the small creatures, this is a good book. A great natural history read...and it actually makes invertebrates seem as cool as they are! Well told stories about interesting creatures. Very readable popular-science natural history. A reflection of mankind through yah examination of sea creatures. You know when more than one person gives you the same book it was meant to be. Essays on the creatures of the invertebrate class...camel crickets, sea cucumbers, millipedes, sponges, periwinkles, coral, earthworms, horseshoe crabs, and the elusive sea mouse. Good stuff. A lot of what Hubbell writes about in this book has been in the news since and there are already revisions to the science in some cases, but overall an at least interesting collection. Hubbell blends natural history, journalism, and a little personal narrative in the is delightful look at invertebrates.